I will be the first to admit that I love candy but I know how bad it is for me. I was so excited when I first heard about UNREAL candy and The UNREAL Mission. The belief of the UNREAL Mission is that all junk food can be made differently. It can be made with better ingredients, without the junk, with great taste, and at the same price. Basically they want to "Unjunk the world." You are probably wondering how did UNREAL make candy unjunked. They replaced all of the junk with good stuff. They use: double the cacao More peanuts real milk cane sugar and organic palm fruits There are also no artificial preservatives, no hydrogenated oils/fats and my favorite no artificial colors or flavors. I was given the opportunity to host a party to tell people about The UNREAL Mission. I was excited to do this and even more excited that the weekend fell on my Dad's birthday. Everyone who came was excited to learn about UNREAL and many even said that they had seen this candy in stores but had no idea what it was. During the party I explained to everyone about the UNREAL Mission and all of the ways this candy had been Unjunked. Then I let my guests try the candy. It sure was a hit! I can say by far the favorite was th UNREAL 77. These are basically a peanut butter cup candy and were delicious. The peanut butter was so smooth and creamy, it just melted in our mouths. There were several kids at the party and they loved the UNREAL 41. These are candy coated chocolate pieces that remind me of M&M's. When I first opened them I was unsure what the kids would think. Since there are no artificial colors used the color of the candy is not as bright as one may be used to. To my surprise not one child mentioned the color. They went right to devouring them and loved them. I also enjoyed these candies and was amazed at how smooth the chocolate was. UNREAL candies have 30% less sugar, 60% more fiber and 250% more protein per serving than the other leading competing brands. 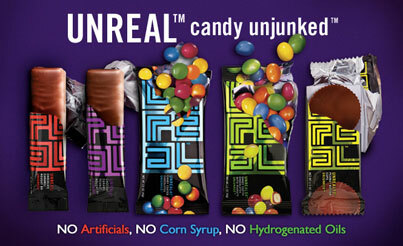 UNREAL candies can be found in many stores including CVS, Walgreens, Rite Aid, BJs, Staples, Krogers and many others. I recently heard Target will be carrying UNREAL soon. I love that this candy is better for you but costs the same as any other leading brand of candy. All of my guests got to bring home a goody bag of UNREAL candy!